Mangoes are a fantastic fruit eaten on their own. They’re even better when they’re magically turned into fresh sorbet. A refreshing, sweet dessert with a bit of tart to balance it all out. This sorbet tastes a lot like the Weis tubs you can buy in the supermarket. The main difference is making it at home means you don’t need to use any added stabilisers. Also, the freshness of the mango will really shine through and make for a delicious, flavour-bomb of goodness. This sorbet was made with the Cuisinart ICE-30. You can check out my review here. There really isn’t much to making mango sorbet. The secret is choosing good quality mangoes that are ripe and juicy. If they’re out of season then forget making this unless you don’t mind spending a lot of money to make it! Mangoes vary in flavour and sweetness depending on ripeness and variety. If you have the choice, I’d recommend choosing Kensington Pride mangoes as they are readily available. They’re sweet in taste, but also have a slight tang. For more information on mango varieties check out this page. 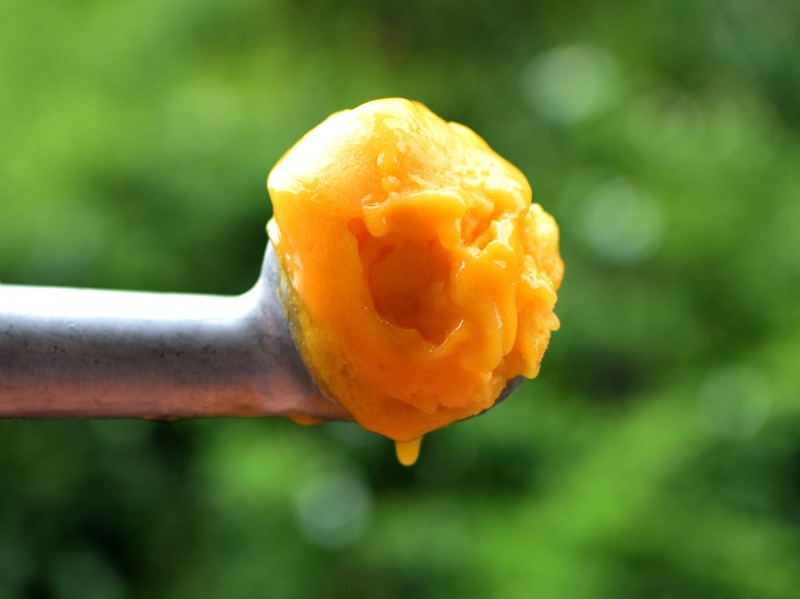 After you whisk the sugar into the mango, you’ll need to taste test the puree to check whether you like it. If it’s really sweet, you may want to add more than a teaspoon of lemon juice and salt. An overly sweet sorbet is pretty hard work to eat a whole bowl. Some other awesome sorbet recipes you might like to try are lemon sorbet, red wine sorbet, or plum sorbet. Add mangoes to a blender with water and puree for about half a minute. Pour mango puree through a strainer into a medium bowl and whisk in sugar. Add lemon juice and salt and whisk until combined. Place puree in fridge for 2-3 hours until cooled completely. Churn in ice cream machine then add to airtight container and freeze for 2-3 hours or until desired hardness is achieved. 1 Reply to "Mango Sorbet Recipe"